Using drugs that are off patent (ie cheap) to “reboot” a patient’s immune system to identify that the cancer they have is foreign and to destroy it. I am from a family of nine – I have four brothers and four sisters. Six of the nine siblings have had stage 1 melanomas removed and my brother was diagnosed with metastatic melanoma. The reason he is alive and well is that he was part of clinical trials. Clinical trials have given my brother another chance at life and my wish is that other families is have that chance to live. My ultimate goal is to see patients with metastatic melanoma enjoy a good quality of life with treatment that will prolong life with minimal side effects. It would make cancer part of a person’s life journey, not the end the journey. Dr Moira Graves completed her doctorate in 2015. In her thesis, she examined DNA methylation (the ”stop” signs on DNA expression) in key genes and multiple sclerosis risk in individual cell populations. This was the first time that specific T and B cell populations were examined in a epigenetic study in MS populations. 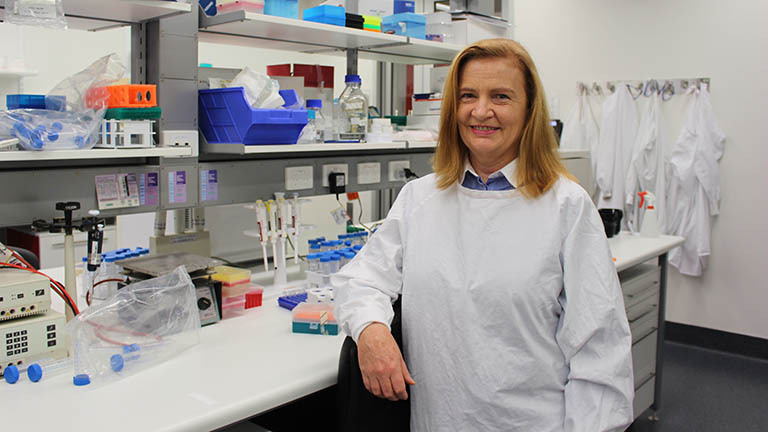 Dr Graves accepted an opportunity to work with Associate Professor Nikola Bowden and will now use her knowledge in DNA methylation in immune cells to apply to melanoma research. Dr. Graves’ current research examines immune cells populations in metastatic melanoma patients who have relapsed on immunotherapy. She will examine the pharmacokinetics of anti-PD-1 therapy in patients with metastatic melanoma. I would like my research in future to concentrate on the individual patient with melanoma as future treatments will be dedicated to the individual. Just as your immune system is unique to you so will your cancer treatment.